Recent projections have hedge funds spending an estimated $2 billion on technology in 2011. Investments in collateral, risk, and data management technology have steadily climbed over the years as the industry matures and systems become more complex and sophisticated. Hedge funds will spend over $2 billion on technology in 2011, with investments in data management platforms and collateral optimisation tools accounting for a significant share of overall expenditure, according to a survey by Citi Prime Finance. The level of technology investment among hedge funds, which has in the past been characterised as "two guys and a Bloomberg" operation, is reflective of the growing maturity and institutionalisation of the industry, says Sandy Kaul, US head of the business advisory services team within Citi Prime Finance, which conducted the survey. "The annual technology spend of hedge funds amounts to almost 10 basis points of industry AUM [assets under management], which may surprise people who tend to think of hedge funds as infrastructure-light organisations," she says. 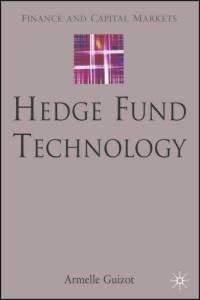 Tags: hedge funds, hedge fund investment technology, hedge funds technology, hedge fund technology, hedge fund technology costs, hedge funds technology cost, hedge fund technology spending, how much does it cost to start a hedge fund?